Ask anybody if they know what tree lights are and you'll likely get one of several answers. Ok, that's not true. You'll likely get one answer out of several possibilities. Most folks only think of tree lights as something to put up at Christmas, but outdoor tree lights actually encompass several different outdoor landscape lighting techniques that take advantage of both a tree's natural beauty and convenience. Having already mentioned Christmas tree lights, we may as well discuss that concept a bit. Of obvious note is that stringing lights in a tree isn't something restricted to Christmas. 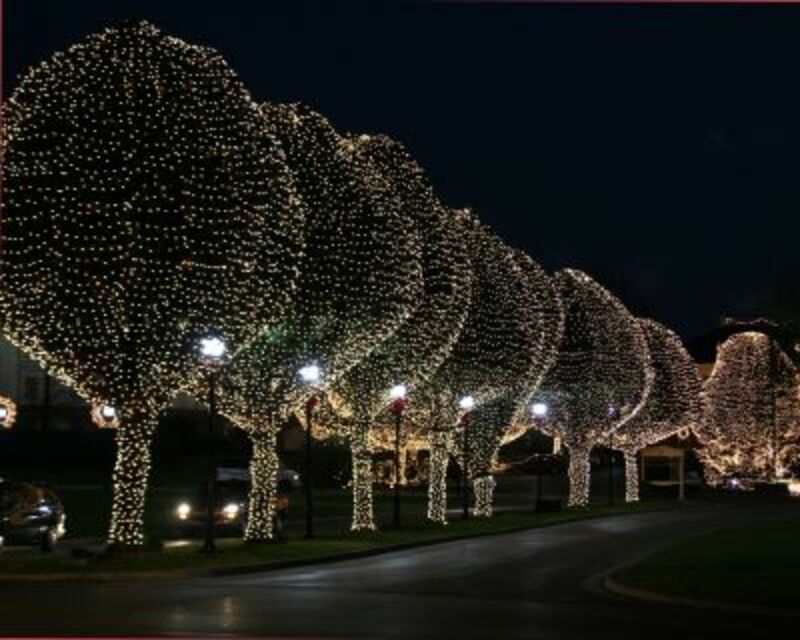 If you've enjoyed dining or shopping in a fine plaza, you may have had the pleasure of seeing beautiful white lights strung into trees. A hotel near my home keeps lights in trees on their beautifully landscaped property all year around. Great "How To" Lighting Books! Assuming the use of white lights, the effect is peaceful and soothing. 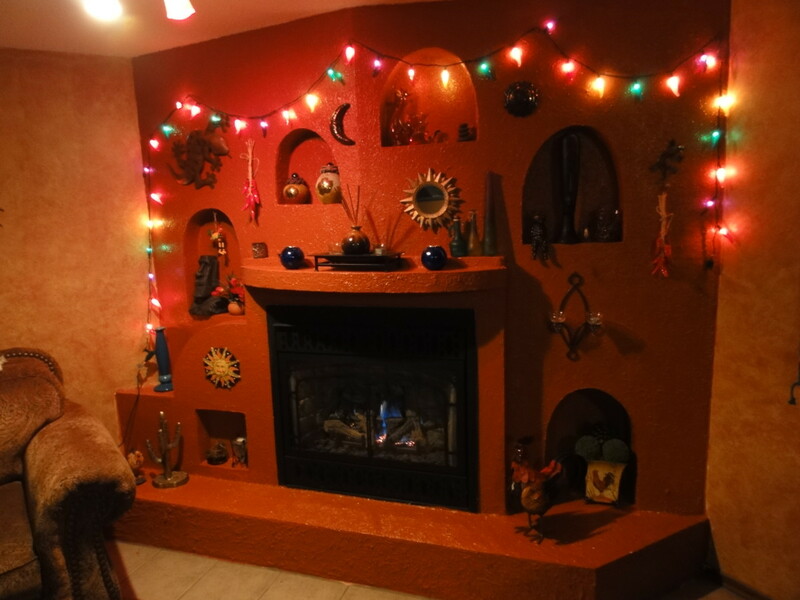 Colored lights evoke more whimsical or festive moods. For home landscaping efforts, I'm an advocate of class and subtlety and would only recommend using small white lights. Opting for colors will work fine for the holidays but results in a decidedly circus-like atmosphere the rest of the year. But, if your objective is a tropical beach-bar setting, you might be able to get away with it. In addition to going for a more muted look, it's also important to know that there's a bit of an art involved in stringing lights into trees. It's one of those things where too much symmetry is not a good thing. Fail to introduce a bit of randomness into your stringing efforts and you wind up with a disturbingly artificial look. 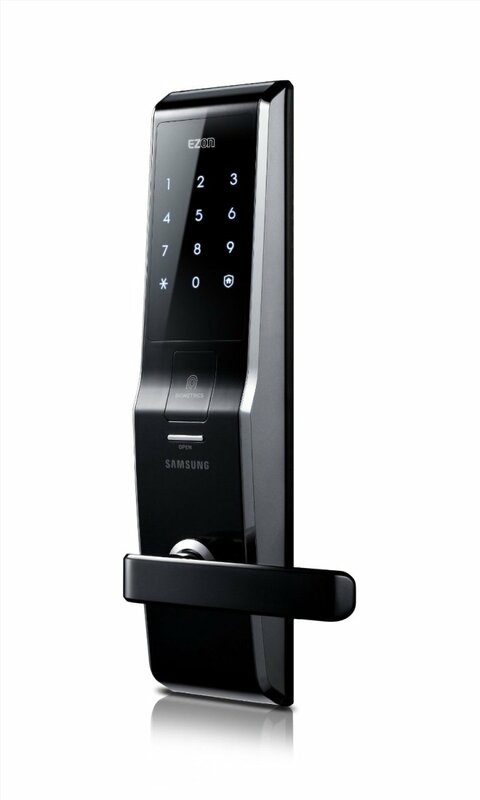 The pattern becomes too evident and detracts from the results. Ever notice how rare straight lines are in trees? Too few lights will compound things as well, making it plain that they are on a string. If you don't string a beautiful Christmas tree once a year, you're probably going to struggle getting it right in your back yard as well. That's not to say that intentional artificiality is always a bad thing. Many professional landscape lighting installers will, at a client's request, try some pretty strange things out. Their experience allows them to pull off what most of us would only botch up terribly. I may be a bit old fashioned, but I'll always prefer the "natural" (there's really nothing natural about thousands of lights in a tree but you get my meaning) look that seems to simulate a thousand lighting bugs in the branches. Stringing outdoor tree lights into your trees differs from other outdoor tree lighting techniques in two primary ways; it's easily the most time intensive and difficult to implement and it's the most frustrating to maintain. Trees are hardly static things. They grow, they have leaves, they lose leaves, their branches break. All of that can contribute to changes and problems in your lighting. 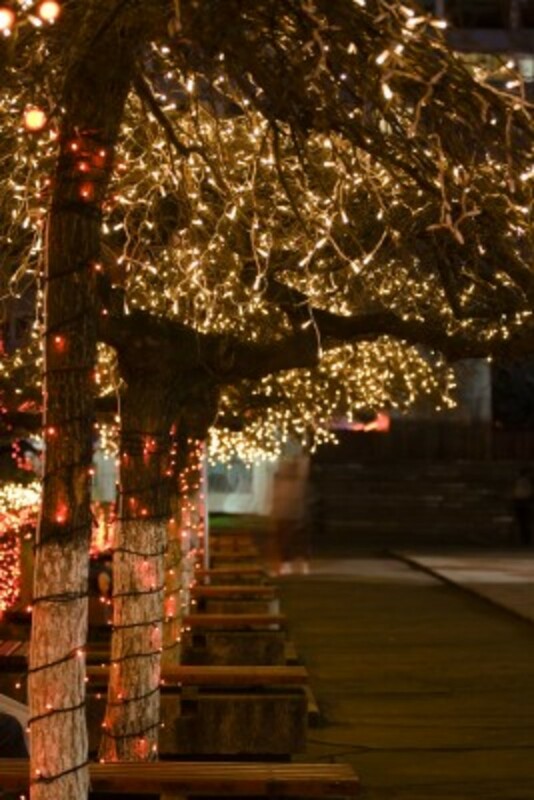 Undertake this style of outdoor tree lighting by yourself only if you are ready to commit to the challenge of maintaining your project on a regular basis and if you have relatively small trees. Otherwise, hire the pros. 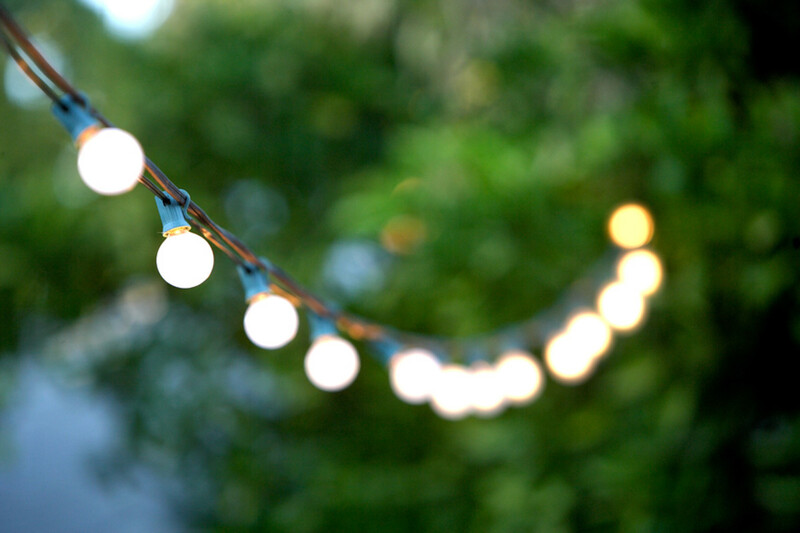 As much as I enjoy outdoor string lights in trees, this technique isn't what I really think of when I think about outdoor tree lights. With string lights, the lights are more the focus than the tree. They may show some of a tree's form or structure, but the lights are actually the main attraction. 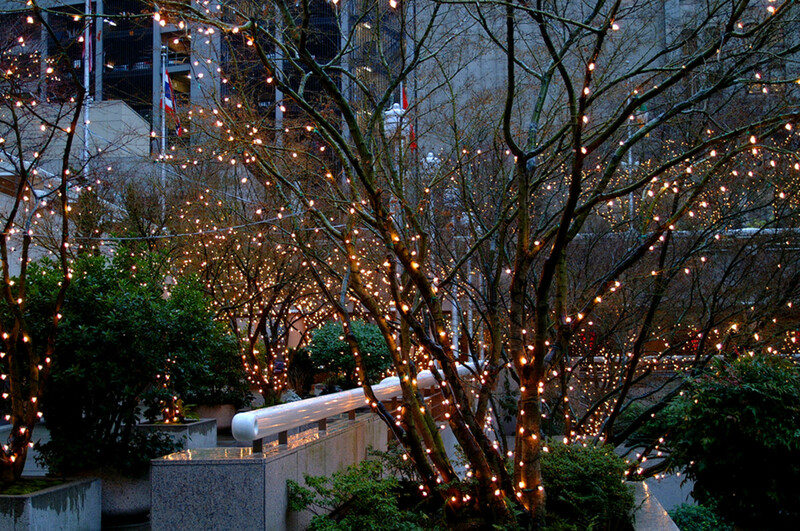 Other techniques in which outdoor tree lights are employed either make the tree a central focus or use it as an anchor point to shine other objects in the spotlight. Moon lighting takes advantage of a tree's internal structure to paint the ground with dappled shadows. Up-lighting shows off the beauty of the tree itself and casts reflected light to the ground below. 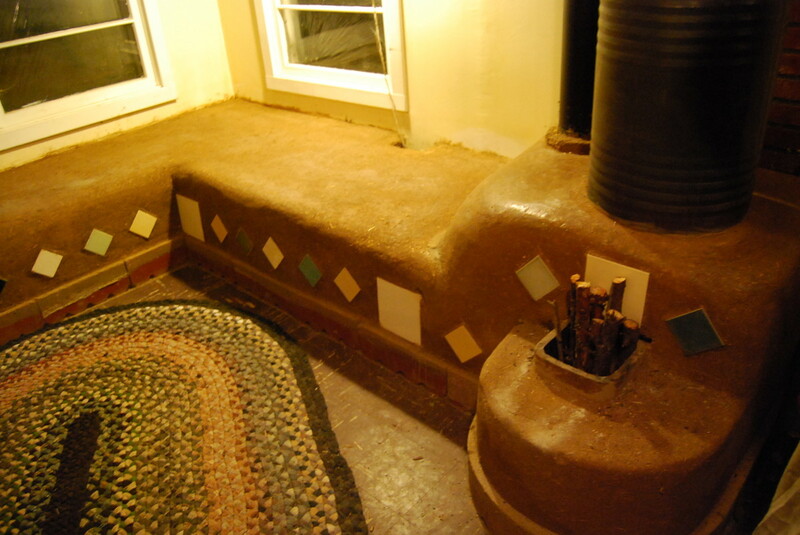 Or lights may be mounted in the tree to down-light other garden features. Each technique warrants its own article and would draw this one out longer than intended but the message you're taking away, I hope, is that you aren't limited only to strings for your outdoor tree lights. Though a perfectly acceptable technique, string lighting trees is labor and maintenance intensive. The results can be worth the effort, if done right. 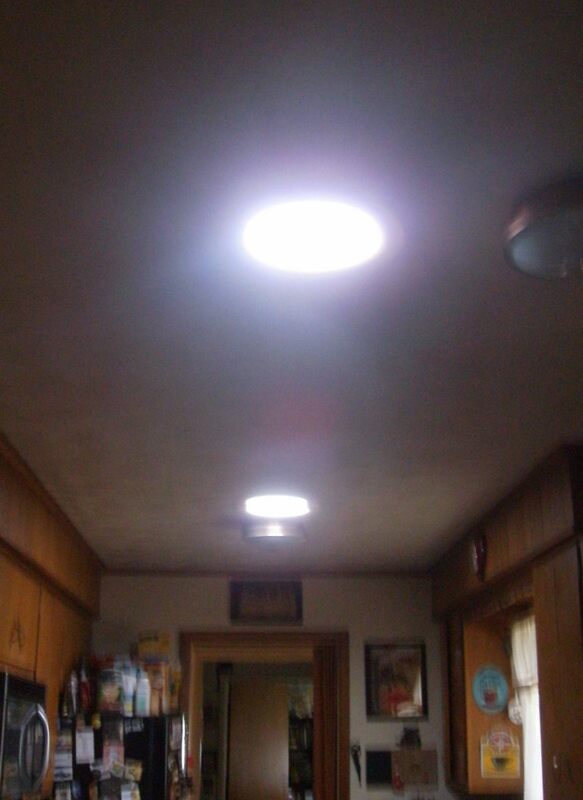 But if you've never installed lights like this, be prepared to redo and readjust your first go several times before you have good results. If that sounds like too much of a challenge, consider alternative landscaping lights or hire professionals to save you the headache.